How is it possible that this is my first biscuit recipe on the blog? Biscuits are my vice. I mean, I spent my most formative years in Georgia, what do you expect? From lazy Saturday mornings in college, to late nights at the Waffle House (ahem), biscuits were my saving grace. I lived down the street from one of Georgia’s (arguably) best biscuit restaurants, Mama’s Boy. I am no where near getting close to that biscuit, but oh how I try. For me, a bite from a biscuit is a reminder of home. It’s a reminder that not all things must be “healthy” and made from fruits, veggies and whole grains. Because what is life without a bit of moderation and indulgence from time to time? Flash forward a few years past my Athens, Georgia biscuit heaven. Here I am in Portland, with maybe 2-3 good biscuit options. Gone are the days of biscuits at the gas station, biscuits on every breakfast menu, biscuits at the corner store. So what is a comfort food cravin’ gal to do? Take up biscuit making, of course. 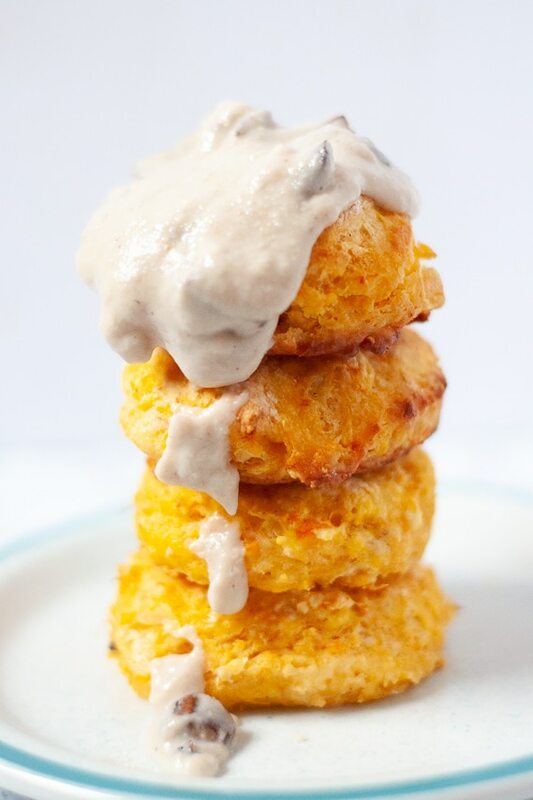 Buttermilk biscuits, vegan biscuits, sweet potato biscuits with cashew mushroom gravy. As you may know, biscuit making isn’t easy-peasy. You don’t just get a fluffy biscuit on your first try. Or your second try. Maybe not even your tenth. But that’s part of what makes it such a labor of love. The best part of making biscuits is that even if they don’t rise up all fluffy and high to the heavens, they still taste so good. I mean, it’s butter, flour, and milk – what do you expect? Those layers of butter (vegan, vegetarian, whichever your heart prefers) and the fluffy, soft texture…oh! Does it get more comfort food than this? Okay, okay, you get it. I could write about biscuits for a while. I could probably do a research paper, podcast, etc. on this topic. 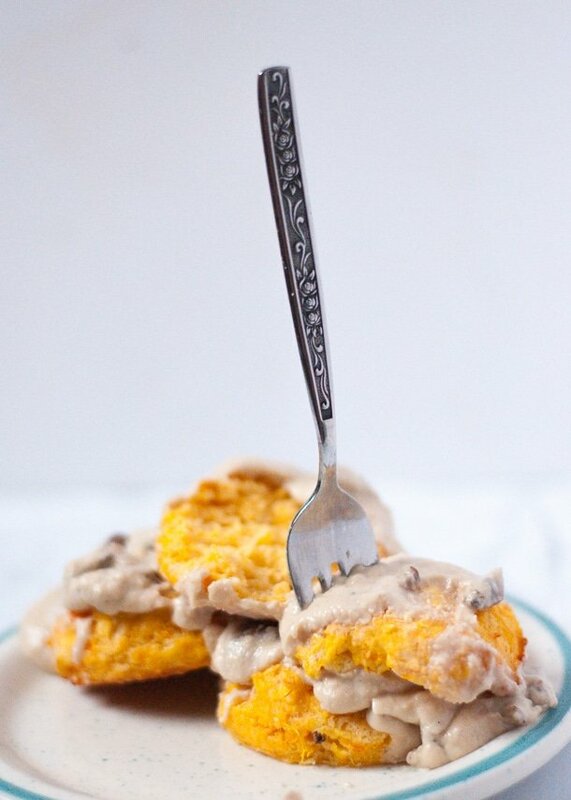 So how did sweet potato biscuits come to be, you ask? 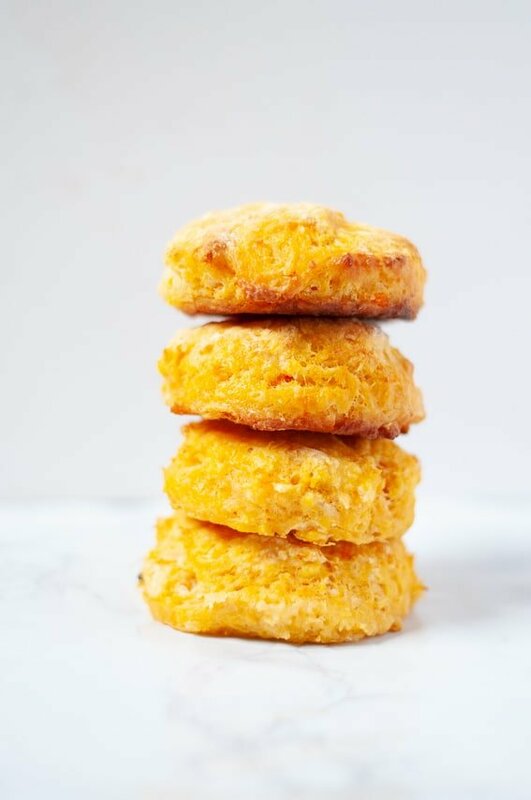 I was first introduced to sweet potato biscuits back in college, when my roommate made them for breakfast. The moisture of sweet potato brings forth a whole new soft and gentle texture to an already delicious biscuit. The slight sweet potato flavor also helps to prevent any baking powder taste from carrying over to the finished product, as sometimes happens with regular biscuits. 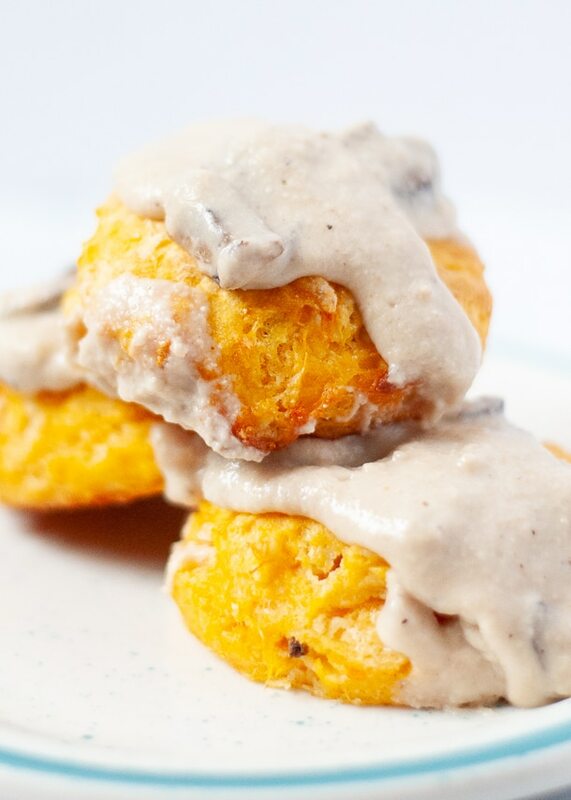 Last weekend I visited a restaurant in Seattle that had sweet potato biscuits with cashew gravy, and I said “Woah! What? !” with every bite. Flash forward to this weekend, and away I work in my kitchen to emulate the creamy cashew gravy that enticed my taste buds last weekend. I love how easy it is to make this gravy. Soak your cashews overight to make them softer, then throw them in a food processor or blender with the remaining ingredients. Blend away until everything is thoroughly combined. The cashews do not actually contribute much to thickening; that’s why corn starch or flour is added to the gravy. No runny gravy here, folks. Mushrooms are often used as a “sausage alternative” in gravies, but I’m honestly just a fan of adding mushrooms to everything. Cashew mushroom gravy is savory, creamy, and the perfect addition to anything: biscuits, toast, even a tofu scramble! Interested in learning more about food history and biscuit methods? Here’s one of my favorite podcast episodes: “Here’s why you should care about southern food“. 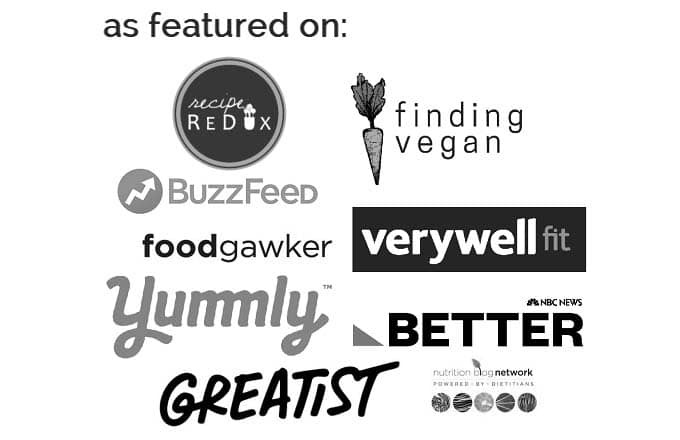 Not about biscuits, but a great listen for anyone who eats. Okay, on to biscuit making! 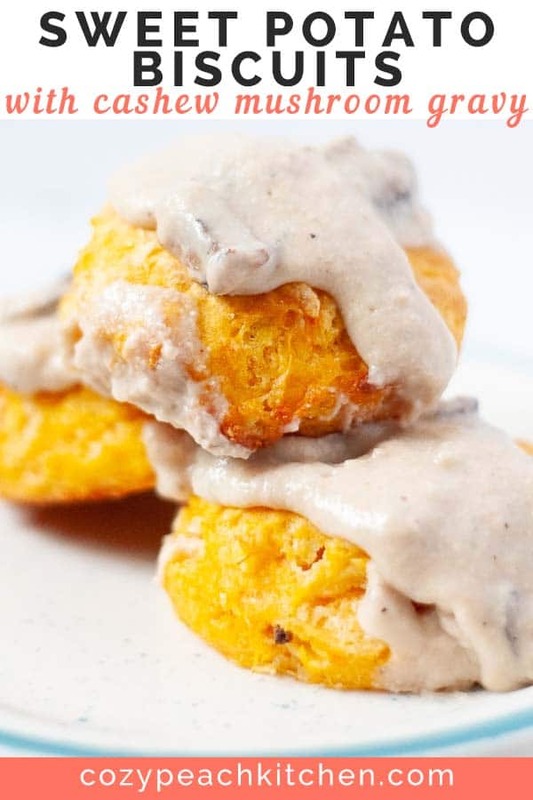 Sweet potato biscuits are southern style biscuits made extra fluffy and moist with pureed sweet potato. 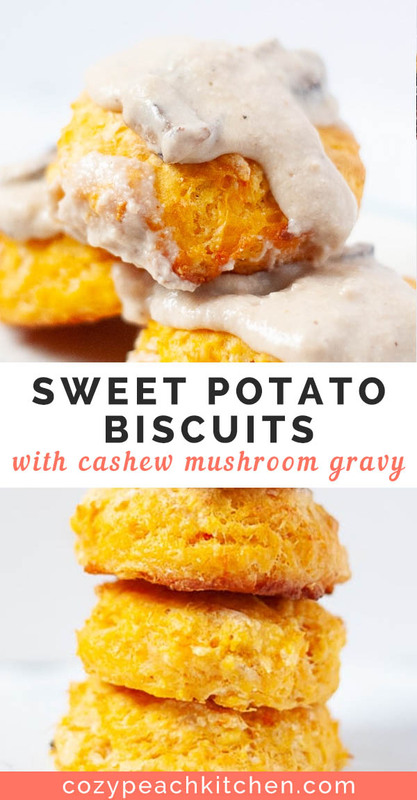 Cashew mushroom gravy is a savory and creamy vegan addition to these biscuits. Preheat oven to 425 degrees Fahrenheit. Chill biscuit making utensils in freezer for at least five minutes: medium mixing bowl, biscuit cutters, dough cutter or forks. Dice butter into small cubes and set in freezer with utensils. Stir together dry ingredients in chilled mixing bowl: flour, baking powder, salt. Cut in butter into flour until pea sized (see external blog links for more information on biscuit making methods). Mix in sweet potato puree. Pour in milk and apple cider vinegar, mixing with wooden spoon until the dough comes together and slightly pulls away from the bowl. Turn out the dough on to a lightly floured surface. Lightly flour your hands. Fold the dough on itself 3-4 times to create the "flakiness" of biscuits. Handle dough as minimally as possible; over kneading the dough builds gluten, which hardens the biscuits. Using a biscuit cutter or sharp knife, cut out biscuits. Do not press down and turn if using a cup to cut the biscuits - this prevents the biscuit from rising as well. Place biscuits on parchment paper lined sheet pan. Bake for 15 minutes, or until lightly browned. Remove from oven and let cool on cooling rack. Keeps in fridge for 2-3 days. Cover cashews in water and soak overnight, or for at least 8 hours. Drain and rinse cashews before using. Add all ingredients, except mushrooms and oil, to a food processor or high powered blender. Process until cashews are mostly broken down, about 2-5 minutes depending on the strength of your blender. At this point, the cashew gravy will be thin. Heat olive oil in pan over medium heat. Add diced mushrooms and saute until softened, about 5 minutes. Pour gravy over the softened mushrooms and bring the heat to medium high. Stir gravy constantly with a whisk. Once the sauce starts boiling, lower it to a gentle simmer. The gravy will be thick enough when it coats the back of a spoon without dripping off. If you prefer thicker gravy, continue cooking at medium low heat until desired consistency is reached. The gravy is best if eaten immediately. 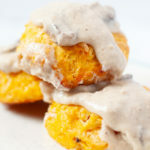 Pour over warm sweet potato biscuits and enjoy! One large sweet potato yields ~1 cup of sweet potato. Poke a few holes in the sweet potato and wrap in foil. Bake in a 425 degree fahrenheit oven for 45 minutes to an hour, until soft. Remove the skin and mash with a fork or potato masher, or puree in blender. Substitute regular butter for any vegan butter alternative. Vegan butter, such as Earth Balance or Miyoko's Creamery, yields the same flaky biscuit texture. Depending on the butter you choose, the biscuits may not brown as much; you may have to keep a closer eye to tell if they're done.